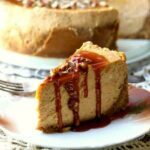 Creamy and rich, this luxurious New York style pumpkin spice cheesecake comes out perfectly every time! The warm, spicy crunch of the gingersnaps give a nice contrast to the cool, rich flavor of the pumpkin cheesecake. Bourbon is optional but really good! Pulse the gingersnaps in the bowl of a food processor until they are crumbs. Place the cream cheese, sugar, and spices in the bowl of a mixer. Still on low speed beat in the pumpkin. Fold in the bourbon, if using, and sour cream with a rubber spatula, folding until the sour cream is completely mixed in. Pass the caramel syrup so guests can add more if they want to.